Merck, a leading science and technology company, today announced its support of World MS Day 2018 and MS International Federation (MSIF)’s #BringingUsCloser campaign through a new campaign, #MSInsideOut, to support the multiple sclerosis (MS) community and deepen understanding of the disease. The initiative will involve a collaboration with Shift.ms, the social network for people with MS, who will be Executive Producers on a new documentary which will feature unique perspectives from the MS community. The documentary will premiere at the 34th Congress of the European Committee for Treatment and Research in Multiple Sclerosis (ECTRIMS) in Berlin, Germany in October. 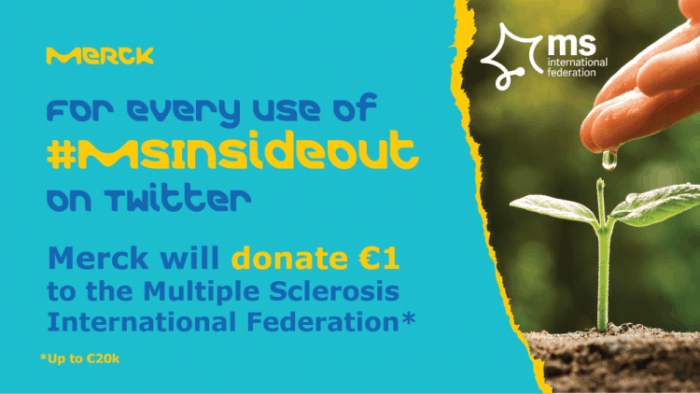 In addition, for every use of the hashtag #MSInsideOut on Twitter until June 8, Merck will donate €1 (up to €20,000) towards MSIF’s research fellowship program – to mark Merck’s commitment to MS over the last two decades. For people living with MS, a diagnosis often occurs in the prime of their lives, ages 20-40[i], and MS produces significant physical disability within 20 to 25 years in more than 30% of patients[ii]. Despite advances in MS care, a deeper understanding of the unique challenges both patients and care partners face is needed. Last year, Merck announced the largest global MS care partner study to date in partnership with the International Alliance of Carer Organizations (IACO). Findings from previous research have shown that problems identified among care partners include anxiety, depression, insomnia and pain, along with concerns about the financial impact of MS for families[iii]. These data, which will be published at ECTRIMS in Berlin, Germany, October 10–12, 2018, further demonstrate the need for a deeper understanding of those affected by MS and their care partners. Merck, a company celebrating its 350th anniversary in 2018, has played an important role in innovation, as well as supporting the MS community more broadly, for more than two decades. Curiosity has always been the force that drives Merck and will continue to motivate the company to apply its expertise in science and technology to achieve human progress. In addition, today, MS in the 21st Century, a Merck-sponsored initiative, is launching a website that will support the facilitation of discussions between patients and healthcare professionals, available at www.msinthe21stcentury.com.